Attleboro, 48 @ Durfee, 44 – Final – Holding a three-point lead with just over a minute to go, Attleboro junior Tim Callahan (12 points) hit a three pointer to give the Bombardiers a bit of a cushion. The Hilltoppers got within three with just under a minute to go but Bryant Ciccio (14 points) and Mason Houle (11 points) each hit a pair of free throws down the stretch to earn the win. Attleboro held a 38-20 advantage on the boards with Lorenzo Wilson (nine rebounds) leading the way. 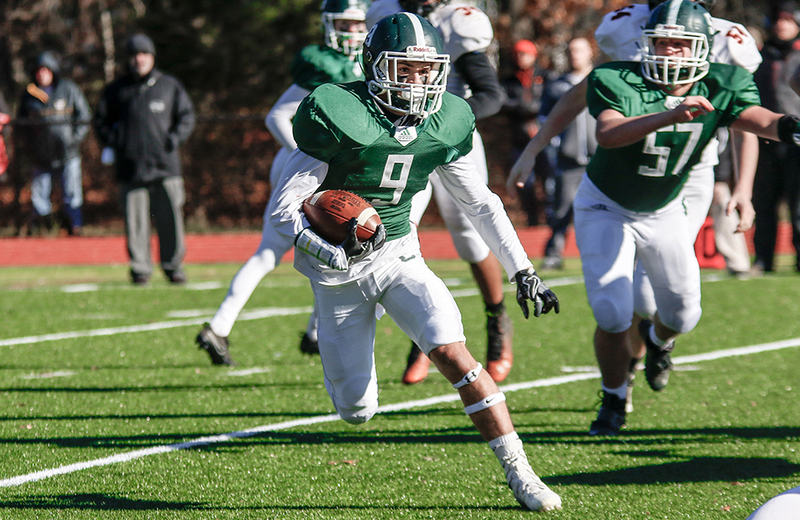 Foxboro, 48 vs. Bishop Feehan, 36 – Final – Foxboro overcame a five-point halftime deficit, limiting the Shamrocks to just 13 points in the entire second half. Feehan led 23-18 at the break but Foxboro put up 20 points in the third and took a 38-31 lead into the fourth quarter. Foxboro junior Brandon Borde scored 13 of his team-high 19 points in the second half while junior Will Morrison added 11 points for the Warriors. Franklin, 73 @ Catholic Memorial, 78 – Final – Franklin led 40-39 at halftime, and took a 59-55 lead into the final frame but Catholic Memorial was able to take the lead midway through. Trailing 72-64 with three minutes to go, the Panthers got within two, and then within one when Jalen Samuels (17 points) hit a three with 9.3 seconds left. But the Knights hit two free throws and thwarted a last bid from the Panthers. Junior Chris Edgehill had a team-high 27 points for the Panthers. Sharon, 53 @ King Philip, 73 – Final – Click here for a recap and photo gallery from this game. Mansfield, 73 @ BC High, 51 – Final – Mansfield built a 10-point lead by halftime but doubled the advantage with a big third quarter in a win over BC High. The Hornets led 35-25 at half and then outscored the Eagles 20-9 in the third to pull away. Senior Damani Scott had a team-high 18 points for Mansfield while Tommy Dooling added 17 points and junior Sam Stevens finished with 14 points. Milford, 59 vs. Westboro, 74 – Final – Milford trailed by just four at halftime, down 36-32, but Westboro outscored the Hawks 20-10 in the third quarter to create a double digit lead that it didn’t relinquish the rest of the way. Danny Corsini poured in a career-high 26 points for the Hawks, including 16 in the second quarter. Brendon Sailer and Jordan Darling each added nine points for the Hawks. Stoughton, 64 @ Archbishop Williams, 58 – Final – Stoughton outscored the Bishops 17-8 in the second quarter to build a double-digit lead by halftime, up 30-18. The Black Knights extended the advantage to 48-32 after three quarters and then withstood a strong fourth quarter from Archies to get the win. Junior Ajahn Rue poured in a career-high 22 points to pace Stoughton. Attleboro, 55 vs. Durfee, 34 – Final – Click here for a Recap and Photo Gallery from this game. North Attleboro, 37 @ Bishop Feehan, 57 – Final – North had a lead at halftime, but the Shamrocks stormed back into the game in the second half and North coach Derek Herber said that the Rocketeers struggled to keep the offense going. Julia Feid was North’s top scorer with 14 points. Stoughton, 42 vs. Brockton, 65 – Final – Aliyah Wright paced the Black Knights with a team-high 21 points. 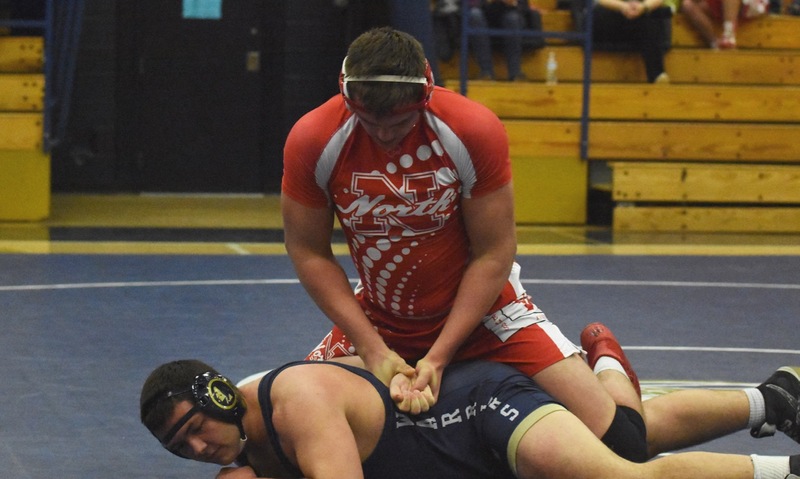 Oliver Ames Quad – Foxboro went 3-0 on the day, beating BC High 41-31, Oliver Ames 41-27, and Plymouth North 57-14. Adam Lanctot, Tommy Gallagher, Mike Sheehan, and William Ogbebor all went undefeated for the Warriors. King Philip, 88 @ Foxboro, 51 – Final – Foxboro’s Dimitri Davis took first in the backstroke in a time of 1:21. King Philip, 96 @ Foxboro, 68 – Final – Foxboro’s 200 relay team of Sarah Egan, Pam Nelson, Lindsey Nelson, and Gina Ouellette took first in a time of 1:58. Mansfield, 65 @ Sharon, 106 – Final – Sharon’s Cleo Zhou qualified for sectionals with the time of 01:07.60 in the 100 backstroke while Shruthi Kaveti, Procheta Gosh, Jyaleen Wu, and Muskan Kumar qualified for sectionals in the 200 free relay with a time of 01:53.28.